See a video of the Decanter World Wine Awards (DWWA) judging week, including interviews with awards chairman Steven Spurrier and guest vice-chair Gerard Basset, as well as Decanter.com weekly columnist Andrew Jefford. 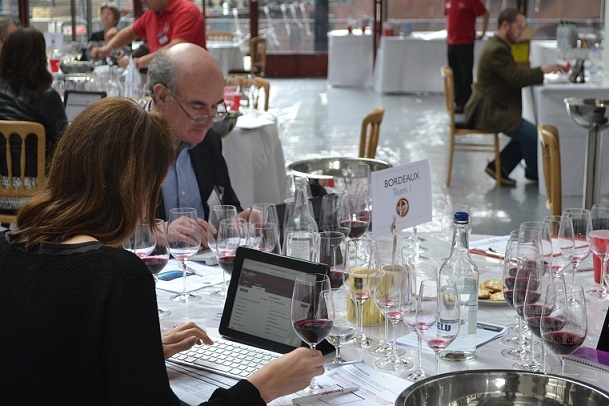 A 240-strong team of the world’s best palates, including 85 Masters of Wine, took part in judging for the Decanter World Wine Awards (DWWA) 2015, which took place at Tobacco Dock in East London for the second year. See this behind-the-scenes video to to find out what happens during the week and to hear from the judges themselves. This year’s competition drew more than 16,000 entries, a new record, consolidating the DWWA’s position as the world’s largest wine competition. There were 23 Master Sommeliers alongside the 85 MWs at this year’s judging week. Judges are assigned specific regions and work under the supervision of Regional Chairs. A small army of assistants, known as ‘red shirts’ after their uniform, work in and between the tasting rooms to keep the judging process running smoothly and to assist judges with any queries they may have. Many members of Decanter’s team, including DWWA and Tastings staff, also give up their normal working week to help out in Tobacco Dock. Results for the DWWA 2015 will be release on Decanter.com on 14 June. Results and full profiles of International and Regional Trophy winners will also be published in the August issue of Decanter magazine, out on 1 July. Markus del Monego, a previous winner of the best sommelier in the world competition.